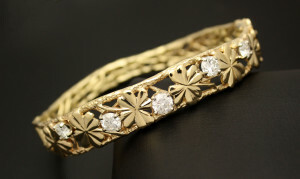 Award winning goldsmith Steve Kriechbaum has been creating custom fine jewelry for over 40 years. 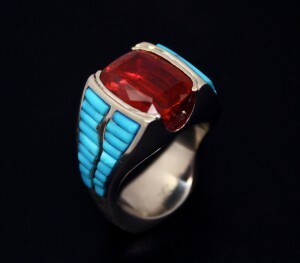 His life as a craftsman began in the fine arts department at the University of Texas, in El Paso. There, his time was spent in the studio focused on sculpture, an aesthetic that is still reflected in much of his work today. 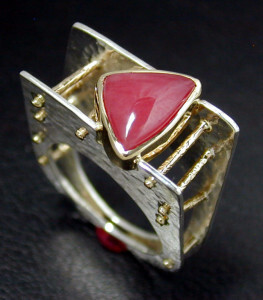 Many designs are centered around bold and colorful gemstones, and are primarily made in 14K/18K gold and platinum. Steve also enjoys working with clients to create one of a kind works that the wearer will cherish, and pass down through generations. He has participated in numerous fine art fairs and can often be seen at the Southwest’s most notable craft shows, like the Armadillo Christmas Bazaar, Midland’s Septemberfest, and Fayetteville ArtWalk. Through these annual events Steve has developed a strong relationship with his patrons; an aspect of his business that he values deeply. When Steve is not making jewelry he enjoys playing music in the band “Little Red” and with the E-Flat Porch Band (McKinney, TX). Steve is also a member of the Jubilee Band at St. John’s Episcopal Church in Austin. He is endlessly grateful to his wonderful family who supports him in all of his creative endeavors.